His buddy Chris generously offered to come help for 10 days, so they spent several nights poring over lists of tools they'd need, and then packing those tools carefully in suitcases weighing exactly 50 pounds :) Tools are quite expensive over there so it was necessary to bring over as much as possible. This was the first of 3 occasions when my husband was required to head over to France to work on the house for almost a month each time (the workers wouldn't work unless we were there unfortunately). Pfew! I'm glad those days are done :) I can hardly believe what's happened over the last year. Talk about unpredictable. 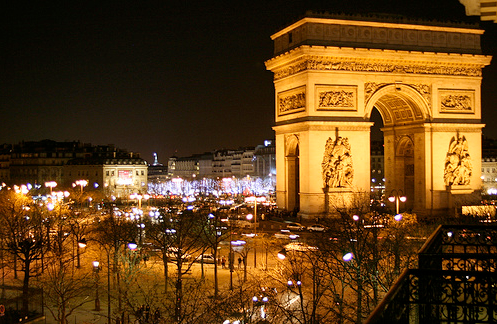 The day before they left Paris, these two friends captured Christmastime in Paris on video, namely the Champs Elysses. It looked chaotic, but incredibly fun at the same time. As a viewer it was easy to feel the energy of the city and I instantly thought about how fun it would be to head over there in December. Just check out the lights! Aahhh...Paris. trying to run across the round-about as a naive college backpacker. I got back from three months in Paris yesterday, and even riding around the arc in a bus makes me fear for my life! And looking down from the top of the arc increases my respect for french drivers incredibly! I have fond memories of the Place de l'Etoile. I remember getting stuck in the middle of traffic there with my uncle once, and someone in another car got out and started pounding our car with his fist. My uncle (a seasoned Paris driver) then got out and challenged him to a fight. My uncle was a big man ... so luckily it ended there. A year and a half ago my friends a I backpacked Europe and we took a taxi around it! What a scary ride that was!! I love your Paris posts. Husband and I are saving our pennies to go in August. Looking at the Paris at Christmas photos remind me to cut back a little right now to enjoy later! We just got back from a short Paris trip and seeing the city all decked out for Christmas was absolutely delightful. My favorite was around the Galeries Lafayette...absolutely stunning! absolutely gorgeous shot. i, too, almost died trying to cross the Champs-Élysées. i finally gave up after 20 minutes of trying to dodge cars. Not for the faint hearted or the weak! i went around in a bus and that was chaotic enough. you were very brave going in a car! so love your blog, it is my daily read. in one of your posts you talked about l'Ebouillante - we got to go there on our last trip to Paris...the omelette's were fabulous and my kids thank you for the suggestion of hot chocolate in a bowl! brilliant. Ahh I miss the Champs de Elysee in December! We use to drive around the Arc every Sunday to go to church(just off the arc de T). My husband was brave and got his French drivers license when we lived there. He LOVED driving in Paris, especially around the Arc! It scared me to death, and I would close my eyes every time and tell him to let me know when we were off! My husband used to work on the Place de la Concorde, and he battled that roundabout daily on a *bicycle* if you can believe it!